I'm not gonna lie. I have failed at my resolution to be a better blogger in 2012. Luckily there's always next year. But first you have to look at what I'm giving away in various spots throughout my house/life. There it is with my lunch one day last week (which also happens to be what I had for lunch today). There it is on Millie. Just hanging out while I went for a little run. There it is on my desk, keeping me company while I worked. Chilling on a completely unnecessary SF Giants coaster. And last but not least, cheesy proof that I take it everywhere these days. The IT in all the pics happens to be a hydration bottle with Thermos brand vacuum insulation technology. This bottle rocks. It is my new favorite. I usually have a cup of water sitting next to the sink in the kitchen and usually keep one nearby when I work. But since I've been using my new Thermos bottle, I have water with me everywhere I go. The best part is the temperature of the water. I don't like my water super cold, but I don't like it once it's room temperature either. So I'm a little picky. Whatever. I can fill my Thermos bottle from the fridge water dispenser, add four ice cubes, and it stays the perfect temperature all day. I actually let it sit overnight after filling it once just to verify this claim. Now that you've heard (read) my two cents, here's some information from a study that will make you want a bottle like mine even more!! It’s easy to hit a plateau during your run, but the key to improving your overall workout might be as simple as cold water. The Journal of the International Society of Sports Nutrition published a recent study conducted by Athletes’ Performance, an elite professional and Olympic athlete training facility in Phoenix, Arizona, to determine the effect of continuous hydration with cold water during exercise. Using hydration bottles from Thermos with vacuum insulation technology, the results of the study showed that drinking cold water (40° F) significantly mediates and delays the increase in core body temperature during exercise, which could impede performance. The longer you work out, the more important drinking cold water becomes. The study results strongly demonstrate that the benefits of cold water hydration for core temperature increase as the length of the workout session increases (reaching its highest difference at 60 minutes). To keep water at the recommended 40°F during workouts, start with cold water from the refrigerator (or tap water with ice) and keep it cold in a hydration bottle with Thermos brand vacuum insulation technology, which will keep drinks cold for up to 12 hours. The vacuum insulation technology provides cold water hydration during workouts to keep your core temperature down, potentially relieving heat-related stress on the body that leads to fatigue and other negative effects on performance. Tell me why you really, really want this awesome bottle for an additional giveaway entry. Share the giveaway on Facebook, Twitter and/or Instagram. Leave me a comment with a link to your sharing of the giveaway love. Each place you share is worth another giveaway entry. But if you don't leave a comment letting me know, I might not keep track of it even if I happen to see it and love it, like it or even retweet it. I'm just lazy that way. Giveaway winner will be selected by Random.org on Tuesday, November 20th. *I was provided a Thermos Hydration Bottle in exchange for my review of the product. Another bottle is being provided for one giveaway winner at no charge to me. I've been a member of you blog for a while now. I love the humor that you include in your musings as well as your experiences with your running endeavors. Hmmm...why do I want/need this bottle? Well, as a runner I don't hydrate anywhere near enough. While I use the insulated (read foam) cups/bottles the drink never stays cold for long which makes me drink even less. My hopes is that with this keeping fluids cold all day that I'll be more likely to drink since I like my liquids cold. I would love to win this bottle so I can give it to my sister. Se just told me this morning her bottle is leaking and was very frustrated. i follow your blog because I love reading it!!! I follow your blog because secretly I wish I could run as much as you and besides that's what cousins do! I need to win because I just started running again post baby (7 months) and I need all the motivation I can get! I love me a good water bottle! I have them everywhere because that's the only way I remember to hydrate. I apparently have something against using a regular drinking glass. For a minute I thought you were giving away a vaccuum and I nearly jumped out of my seat but the water bottle sounds awesome too. I'm your number one fan! So glad I remembered to stop by your blog! I am now officially a follower. Thanks for your inspiration! I've been reading your blog for a while now - love that you discuss the joys (and sorrows!) of being a mom and how it all balances out with being a runner, too. Could totally use a new water bottle - none of mine are all tricked out with thermos-capabilities. Ooooh. For a change of pace, and instead of entering, I thought I would just say "Hey"
New follower to your blog. Liking it so far. I need/want this water bottle because I am sick of all the sweaty cups on my counter in TX so I don't drink as much water as I use to. I follow your blog because you are AWESOME!!! Don't know if being your sister disqualifies me from entering though...I also secretly wish I were a runnerd like you! i follow your blog!! and love it! I love that this bottle is super insulated and would be great for warm summer days! (yes, I am thinking that far ahead lol) I am in desperate need of a good water bottle, and I think this would encourage me to drink more! Need to cancel out the diet soda. Hope I win! I love your blog! I am a big fan and love getting a runner's fix every time I visit! 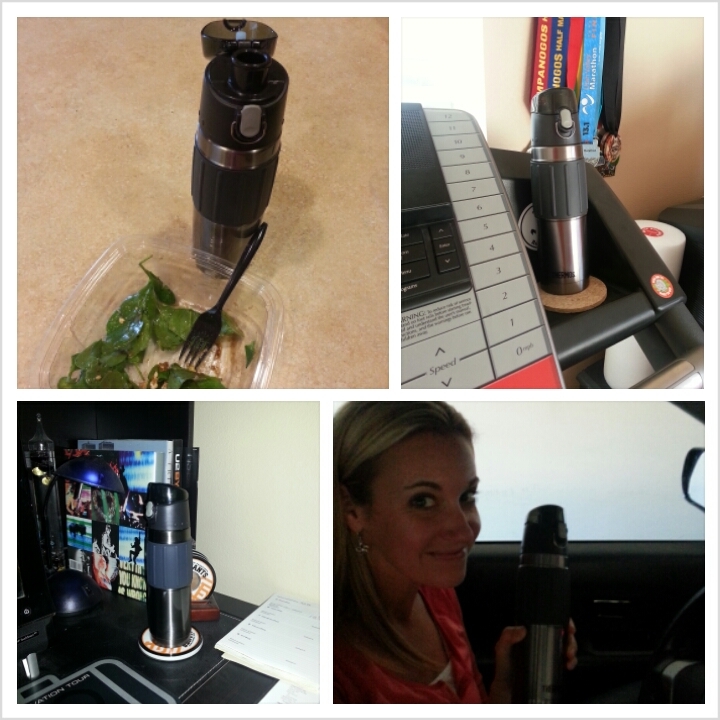 Staying hydrated is SO important...I would really love to win this hydration bottle with Thermos brand vacuum insulation technology, because, according to your review, it rocks! I would definitely drink more water if it's always the perfect temperature! Color me a runner? Mud not included.